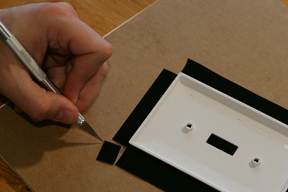 Using a utility or Exacto® knife, cut a rectangle around outlet cover leaving an extra 1/2” around the cover. 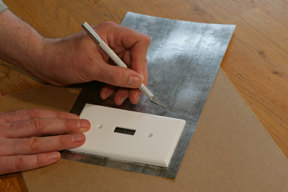 Peel off backing and lay laminate face down on your work surface. 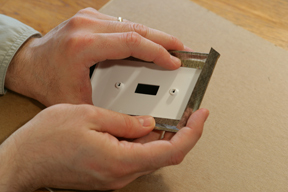 Place the outlet cover face down in the center of the laminate. 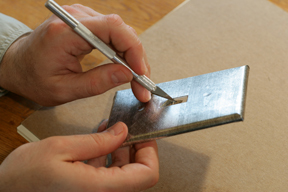 Cut away small squares at each corner to allow fold. 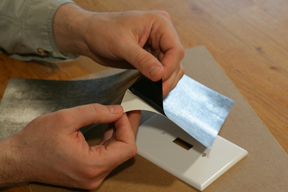 Tip: When wrapping the outlet cover foil around the backside of the wall plate, additional tape may be used around the edges to hold the foil in place. 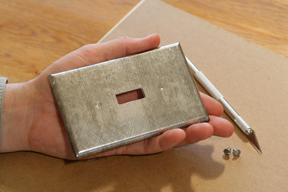 Cut away switch hole and screw holes with a utility knife or hobby knife. 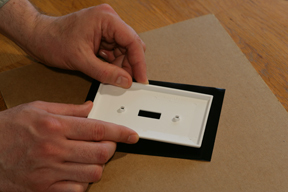 Your matching outlet cover is now ready to be installed.